A strong defense wins championships. This statement has been repeated constantly by sport teams over the years. Yet how does that apply to everyday life? This past week, I had a bicycle accident. The bike tires hit what this northern transfer calls “rubber ice.” For those outside the state of Florida, rubber ice is a byproduct of rubber mats placed on sidewalk corners. Their purpose is to prevent people from slipping on the pavement. However, the problem occurs after a rain shower when the rubber mat becomes wet. When bicycling, one must approach these mats directly head-on or risk having the tires spin out of control. The later is what happened when I quickly turned onto the sidewalk at an angle. The tires didn’t hold and the bike went into a slide. When everything stopped, I was a pretzel caught under the bike with my cheek rubbing the cement ground. Thankfully, I was wearing a helmet which took most of the blow to the head. I was fortunate to walk away with only minor scrapes and bruises. I recall in those early years once driving my auto on the service drive of a freeway when another car ran a stop sign and broadsided me. The impact knocked my car off the road toward the freeway which laid approximately 30 feet below. The impact knocked me from the driver side to an upside down position on the passenger side. When the car came to a stop, my head was on the passenger floor mat and my feet upright hitting the ceiling. My right hand though hung onto the steering wheel keeping the car from toppling off the service ramp into the traffic below. Again, I was fortunate to walk away with bruises and minor cuts. This was before the law of the land required seat-belt usage. Anyway, after that ordeal wearing a seat belt became my standard before it was even a legal requirement. Today, wisdom recognizes the safety importance of wearing helmets when cycling and seat belts when driving cars. One never knows when outside circumstances could cause a damaging accident with crippling human results. The apostle Paul outlines in the book of Ephesians the defensive measures that a Christ-follower wears to prevent catastrophe against the devil’s ploy. He described it as the whole armor of God. 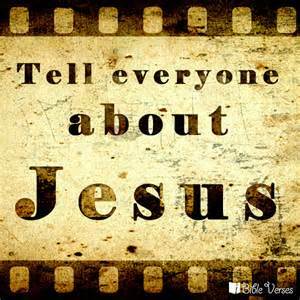 It includes Truth, Righteousness, The Gospel, Faith, Salvation, Word of God, and Prayer. If you want to have a strong defense, than it is recommended that one learns, understands, and integrates each of these tools into your life. The world’s circumstances will test you through unexpected battles. To survive and endure to the end requires putting on the defensive gear before an unplanned accident occurs. With the proper equipment, one has a better chance of walking away with only minor bruises and small cuts. Those who aren’t wearing any protective gear though will experience the full impact of an accident’s fury. Whether bicycling, driving, or moving through life’s jungle, one needs to be prepared for the unexpected. The armor of God helps you to manage the risk of the unexpected. How often have we expressed the same? What did we do with that feeling? Did we follow through as a victim of our feelings? Or did we balance the feelings with God’s Character? Did we weigh the feelings with His Word? What is the truth when you compare your feelings with His Word? Yes, there are times when our feelings will be correct. 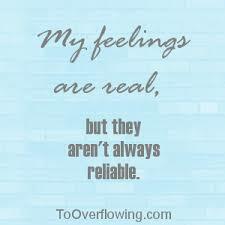 Other times your feelings will blind you to the truth. Be a wise person. Stop, pull back, and evaluate the situation. Don’t let your feelings lead you unless you already know they are built upon the foundation of God’s love, grace, and truth. Sometimes when performance doesn’t measure up to expectations, people have the tendency to focus on fixing their weaknesses rather than buildup one’s strengths. Good coaches though help you to operate around your strengths and compliment your weaknesses. We see this in sports. Take football as an example. We see how this year’s Cleveland Brown’s offensive coordinator has built a system around their quarterback’s strength. The quarterback, Brian Hoyer’s strength is the mid-to-long ball arena. Therefore, the Cleveland team plays a horizontal game where Brian is constantly throwing down field rather than short routes. The short game is his weakness. The long game is his strength. Since implementing this strategy, Mr. Hoyer leads all quarterbacks in performance ratings for long throws down field. As a result, the Cleveland Brown’s are in serious contention for a playoff spot when no one gave them a chance in the beginning of the year. The same is true in business. 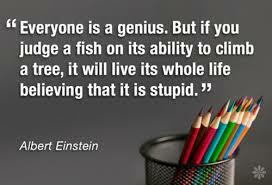 Almost every single successful business is built around the entrepreneur’s strengths. When the business owner starts to deviate away from their core strengths is typically when the business starts to falter. The process is usually slow because the owner is trying to save money by doing it herself. The problem is it takes him twice as long to complete the job than someone else whose strength is a perfect match. We see this when a business is built on the sales skills of an owner. When he also tries to keep the company books he is travelling outside his area of expertise. Yes he may save a few dollars in the short term, but in the long term he is losing opportunities to sell which is how the company became successful in the first place. This is also true in leadership. Abraham Lincoln is a good example of someone who understood this principle. When he was elected President. he surrounded himself with the best people knowledgeable in their field of specialty. His cabinet consisted of “political enemies” and “self-seeking” businessmen. He knew his strength was his gift of discernment and communications. Therefore, he exercised his primary strengths and complimented his weaknesses through the people around him. Most novice leaders surround themselves with like-minded people. President Lincoln was not a novice. He accepted the confrontations and egos knowing it provided him with the best support to effectively lead the country. As disciples, we likewise need to learn to build our lives on our primary strengths. That means the foundation of Jesus Christ is firmly planted in our life. That we know His Word and follow His Spirit enthusiastically. We accept the natural gifts that God has bestowed upon us and find ways to express them for God’s glory and the sake of others. We realize our shortcomings and surround ourselves with people and boundaries that compliment us in our journey through life. As we lean on our primary Strength, the Triune God, we learn to integrate and grow God’s Kingdom through our work, family, and other pursuits. Life in Christ is most enjoyable when our God-given strengths work together with others for advancing His plans. We experience what being fully human was originally intended when God created humankind. When God’s Spirit merges with our souls, God’s new creation becomes a reality in our world today: Build Strengths, Compliment Weaknesses. A proven principle that works! When you find out you are no longer the smartest, strongest, fastest, or whatever you are good at, maybe it is time to start: LOH. When you realize you can’t do it alone, others have failed you, and you don’t know where to turn too, LOH. When you finally admit you are broken and need help, LOH. When your dreams are shattered, your hope disappears, or you feel forsaken, LOH. When you come to the end of yourself, and can’t go any further, LOH. Or maybe instead of waiting until you reach that moment of truth, you get ahead start today. 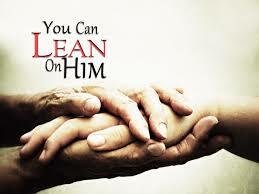 You may be pleasantly surprised of the outcome when you first learn to Lean On Him. Our Triune God wants you to have a life like His. Though we are limited by physical boundaries, He has wired us as a mini reflection of Himself. He wants you to learn and grow into His complete image. It all begins when you learn to lean on Him. 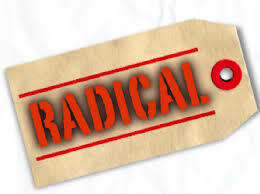 How radical is that?